More Squirrel Shenanigans – and the OWLS! 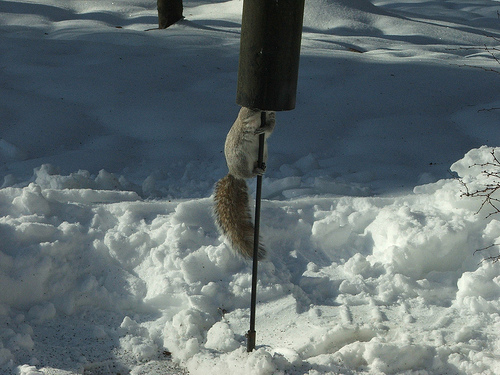 Posted bykaat	 January 30, 2009 January 31, 2009 3 Comments on More Squirrel Shenanigans – and the OWLS! To follow up on yesterday’s Outdoor Hour Challenge on Squirrels, here are some of today’s nature pictures. Baffled again… But not for long. This is a tiny one. It’s the first time I’ve seen it. At first I thought it was a chipmunk, it’s that small. 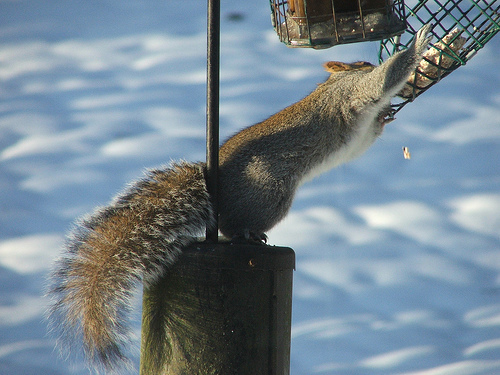 It’s very reddish brown: is it a young Gray Squirrel (do they turn gray as they get older? ), or is it another species? It didn’t venture far from the tree. 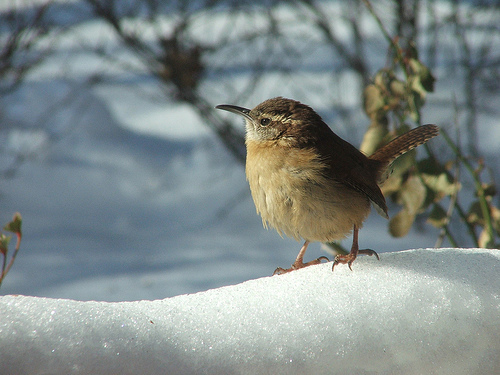 The Carolina Wren, who was really the hero in this photo and this one. 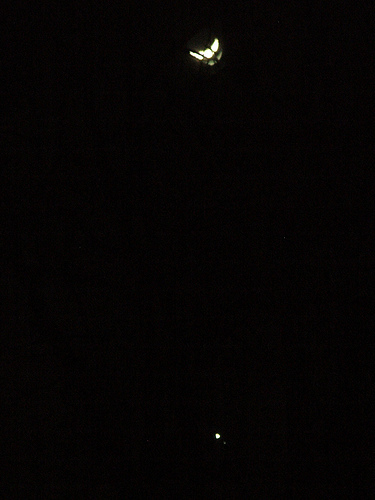 The Moon and Venus below it. 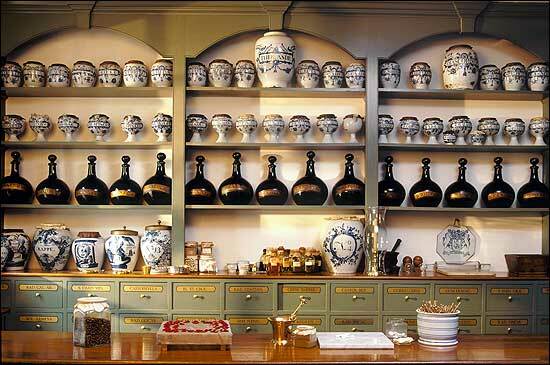 And even later, just now as I am writing this – O my! – I can hear the Great Horned Owls who come here every year, in the coldest of winter, to breed (r have they been here all along?). I hear him, a low “Hoo, hoo-hoo” and her reply, a higher pitched “Hoo, hoo-hoo, hoo-hoo”. I was told about these owls by a neighbor. I wonder, if he hadn’t told me about it, and if I hadn’t been waiting to hear this for the past month (at least)… would I have heard it? 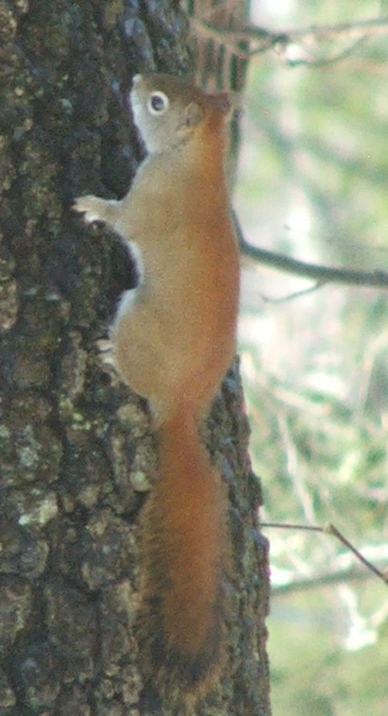 Definitely a different species of squirrel. 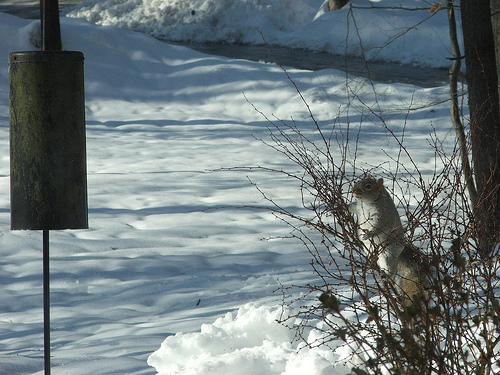 Look at that black tip on the tail…decidedly different from the gray squirrel’s. 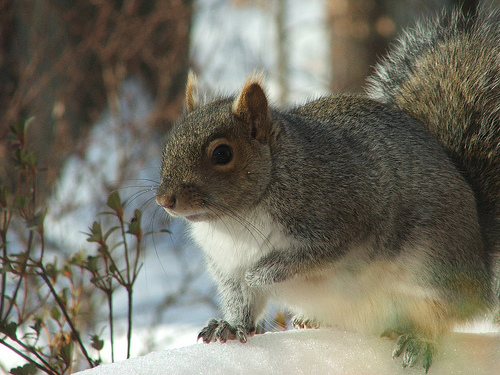 Do you have fox squirrels where you live? The reddish ones here are fox squirrels but I know you live on the other coast. Wonderful entry and I would love to hear your owl. We have short eared owls and spotted owls. Sometimes they who-who and sometimes they screech…..spooky. What marvelous close up squirrel pictures! I love the red one – how cute it is! you seem to be having the same weather I am – we are soooo snowed in and bird watching is about the only “outdoor” activity we’re getting to from the warmth of the house. I also enjoy hearing the great horned owls. I think it’s about mating season for them – we should check that out.